Here's one for the ladies! 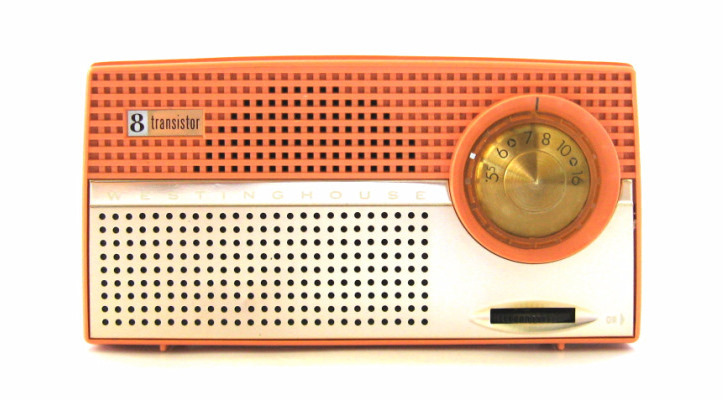 This Westinghouse H695P8 was manufactured in the USA circa 1957/58. 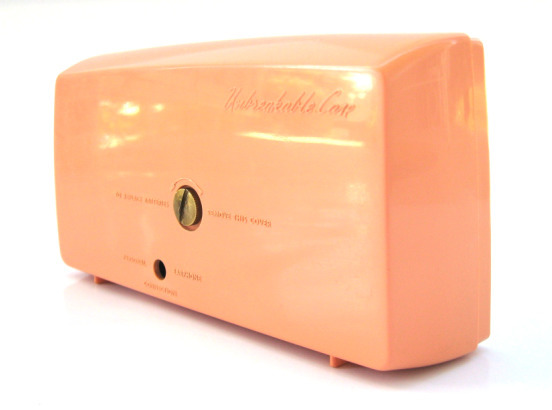 Westinghouse calls this colour 'Pink' but I would call it 'Peach'; I mean, c'mon, this writing is pink! This is a beautiful radio deserving of far more respect than it receives. 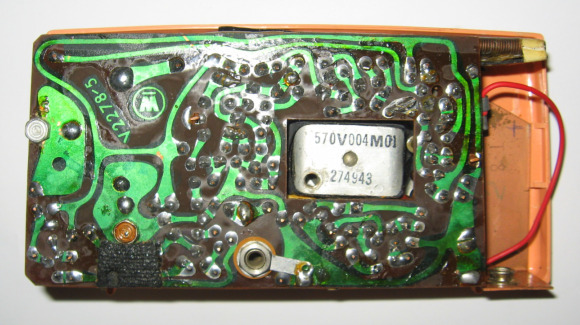 In fact this is the case with many American manufactured transistor radios as they are often overlooked by collectors. 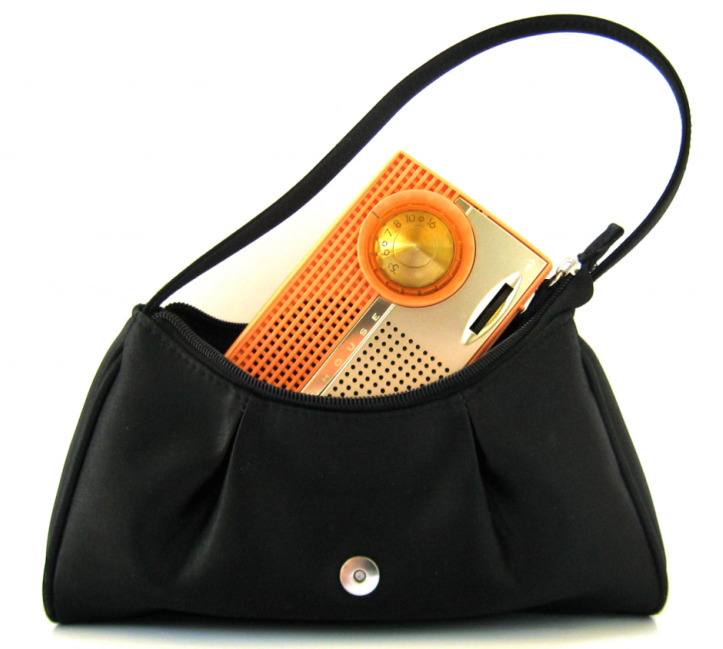 Keep in mind that early American sets such as this paved the way for those superb Japanese designer radios that we all love. These are pioneering sets with a simple, classic charm all of their own. 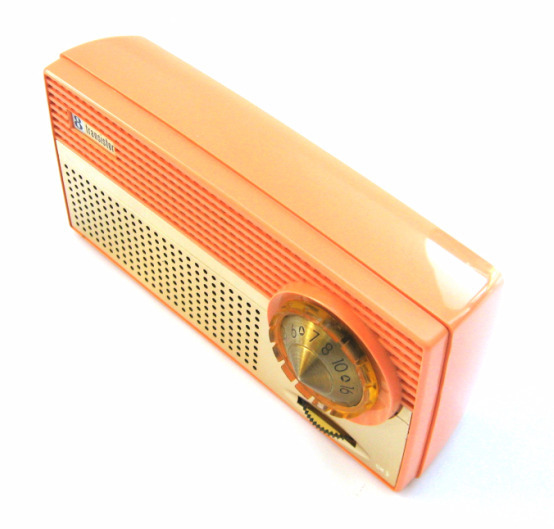 "American transistor radios were leaders in styling, in types of materials used, in decoration and surface treatments and in efficient manufacturing techniques. They are at once rugged, practical and beautiful." 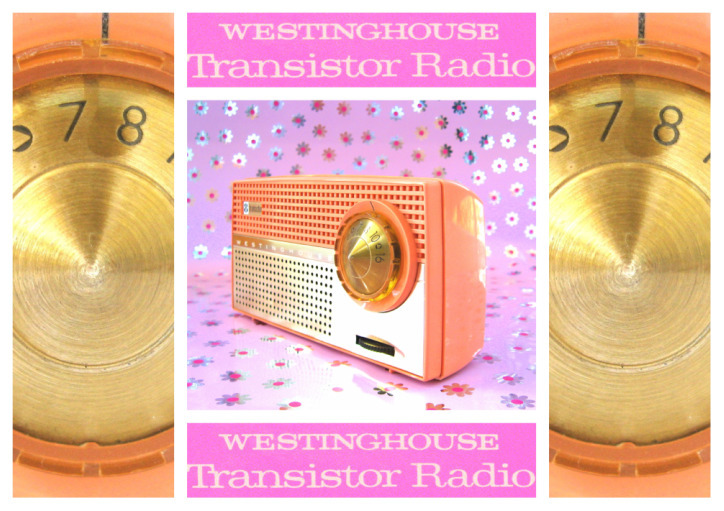 This Westinghouse 8 Transistor looks great in peach (pink??) with its protruding Thunderbird's style tuning dial and perforated metal and plastic speaker grill. There is a metal strip along the front that separates the opposing halves of the grill and on this 'Westinghouse' is stamped in white. 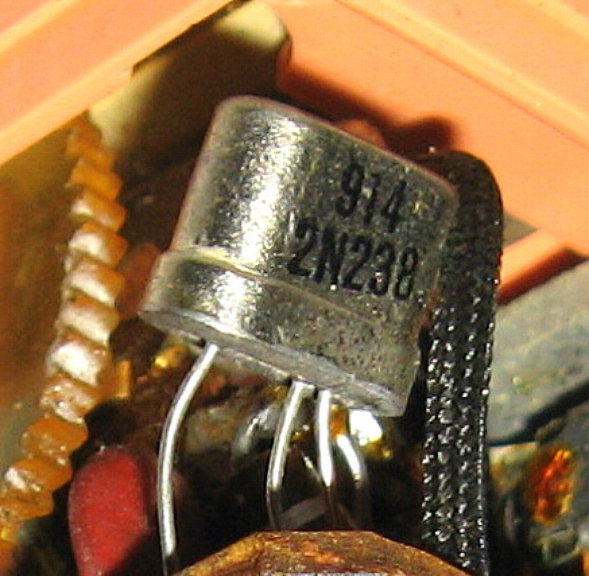 On the upper left is a small badge that proclaims '8 Transistor'. Unbreakable case is printed on the back. The peach cabinet has pleasing lines and curves, much like a lady. It measures 6 x 3.12 x 1.75 inch / 152 x 79 x 44 mm. 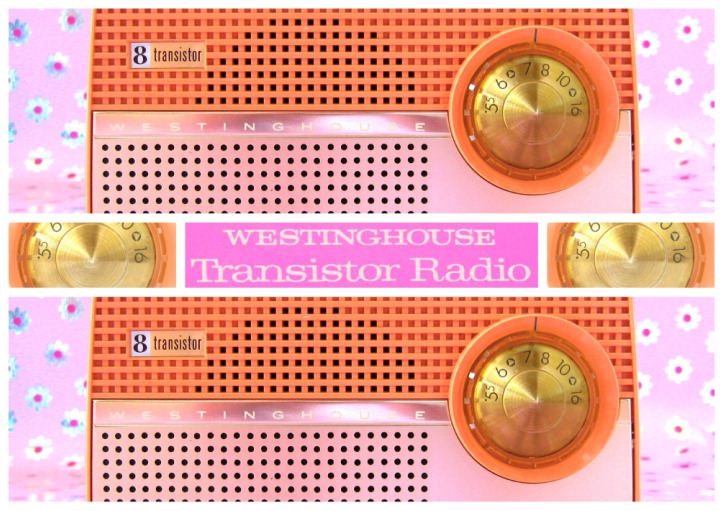 Whilst admiring my latest acquisition I was pondering this question; what was the first transistor radio made by Westinghouse? After viewing historic auctions and SAMS Photofact sheets, perusing RadioMuseum.com, researching old 1950's newspaper ads and reading my collectors books I came to the following conclusion. 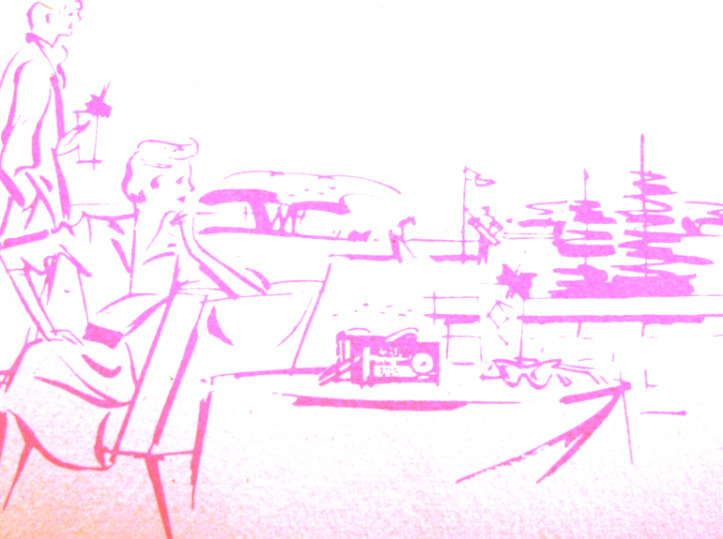 I believe that it was most probably the 7 transistor H587P7A from 1956. 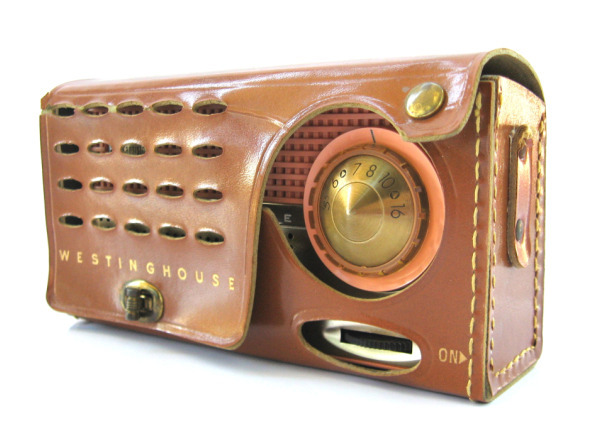 During this time Westinghouse also made a rare leather clad lunchbox style model, H602P7 and a 5 transistor model H610P5. Both the 7 transistor H587P7A and the 5 transistor H610P5 use the same cabinet as my peach H695P8 but with small cosmetic differences. 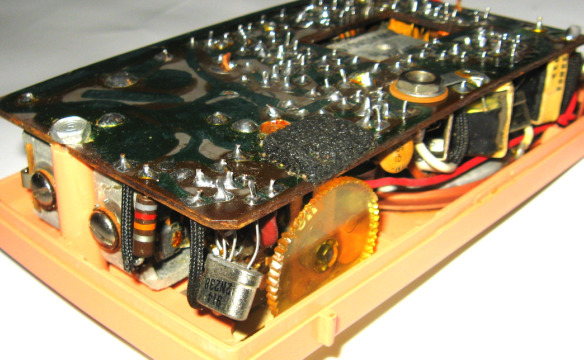 Both have a larger tuning dial and the H587P7A has SEVEN TRANSISTOR inscribed on the front and the H610P5 has ALL TRANSISTOR on the front. 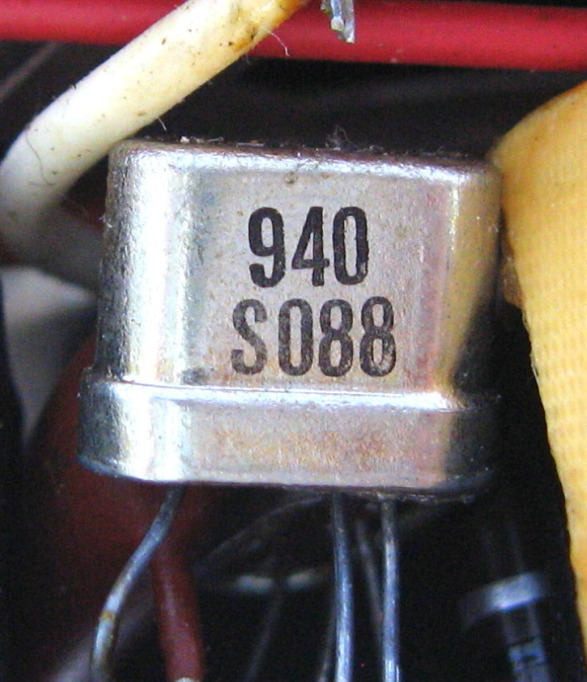 If I were to follow the logical pattern used by Westinghouse for their model numbers then the7 transistor H587P7A would be the earliest of the three followed by the lunchbox style H602P7 and then the 5 transistor H610P5. I imagine that all three models would have been released within a year of each other. During my research I noted that the early H587P7A was advertised for $69.96 in a December 1956 edition of the Milwaukee Journal. 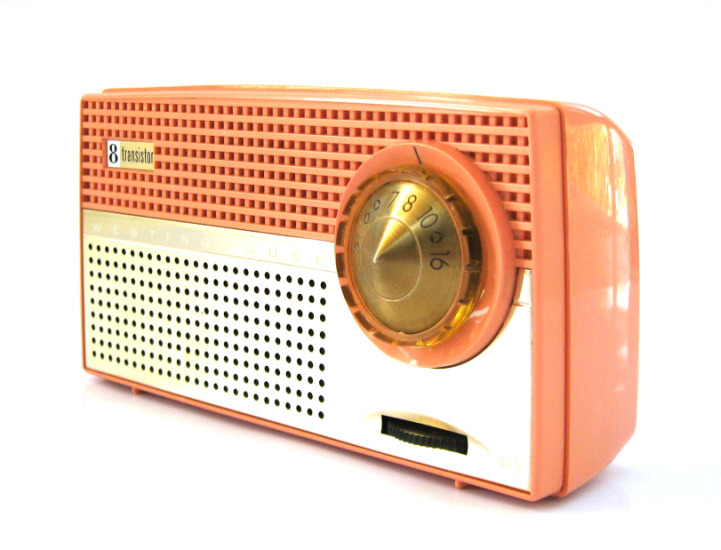 A later model, the six transistor H...P6 series was advertised for $39.95 in an April 1959 edition of the Pittsburgh Press. 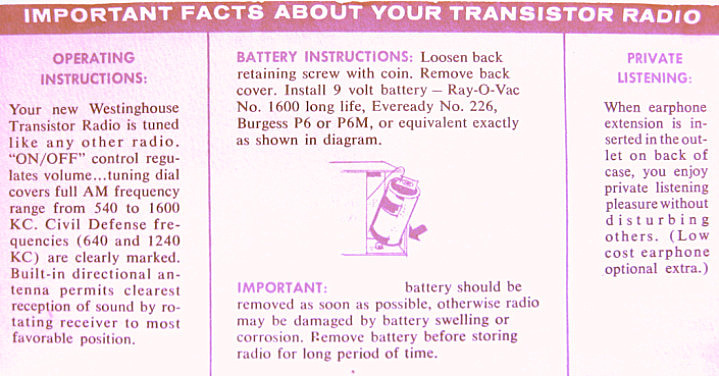 Westinghouse were still selling tube portables in 1957 although they were considerably cheaper than a comparable transistor radio; at this time a four tube model was advertised for $26.88 by the Good Year Service Stores. Westinghouse made four models between 1956 and 1959 using this cabinet and utilizing either five, six, seven or eight transistors. In approximate chronological order: The H...P7 seven transistor series; H587P7A gray, H588P7A black & pearlescent gray, H589P7A red, H617P7 oxford white, H618P7 black, H619P7 red. The H...P5 five transistor series; H610P5 charcoal, H611P5 turquoise, H612P5 Oxford white. 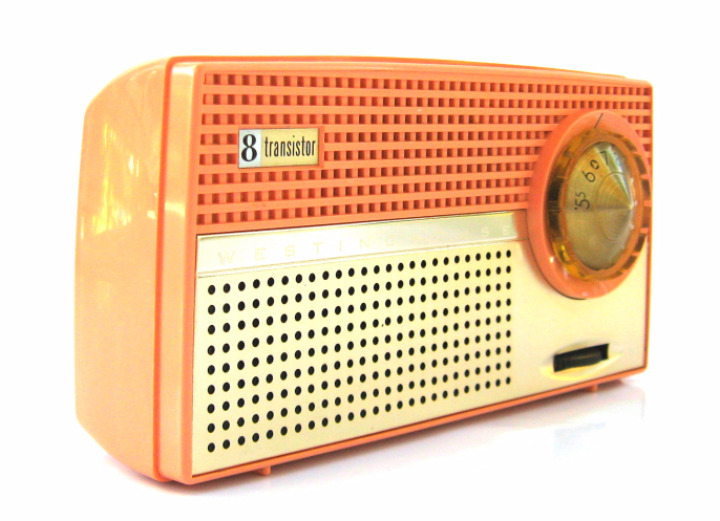 The H...P8 eight transistor series; H693P8 brown, H694P8 green, H695P8 pink/peach. The H...P6 series: H651P6 charcoal, H652P6 turquoise, H653P6 Oxford white. I've noted that there are colour codes within the listed model numbers and the last number of each sequence corresponds with the number of transistors used. Westinghouse Electric Company was founded by George Westinghouse in Pittsburgh in 1886 as a way of entering the infant electrical industry. This new company was in direct competition with its great rival General Electric (GE) from the early 1890’s onwards. During the 1910's the company accumulated patents in the area of wireless communication. In 1919 and 1920, it joined RCA, General Electric and several other companies in a series of cross-licensing agreements that paved the way for the commercial introduction of radio. 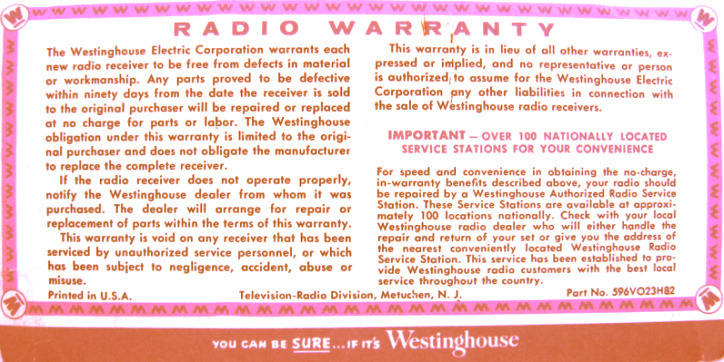 Under these agreements, Westinghouse and GE carved up the exclusive right to manufacture radio receivers between them, with RCA as the selling organization. Westinghouse had also become a pioneer in radio broadcasting when it realized that continuous service would help boost receiver sales. In 1920 it set up radio station KDKA, which broadcast from the roof of the Westinghouse plant in East Pittsburgh. Over the next five years it opened several more stations across the country, and broadcasting has remained a substantial part of Westinghouse's business ever since. The first electrical appliances for consumers were also introduced in the 1920s and Westinghouse was at the forefront. The company offered a variety of products, from electric ranges to smaller household appliances. 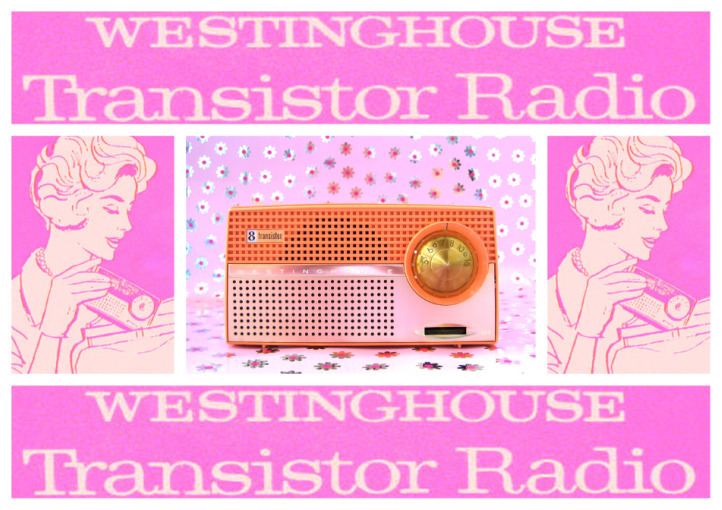 Westinghouse probably manufactured their first transistor radio in 1956. Today Westinghouse Electric Corporation is among the USA’s largest electronics companies, servicing the U.S. defense industry and with interests in power generation and manufacturing. 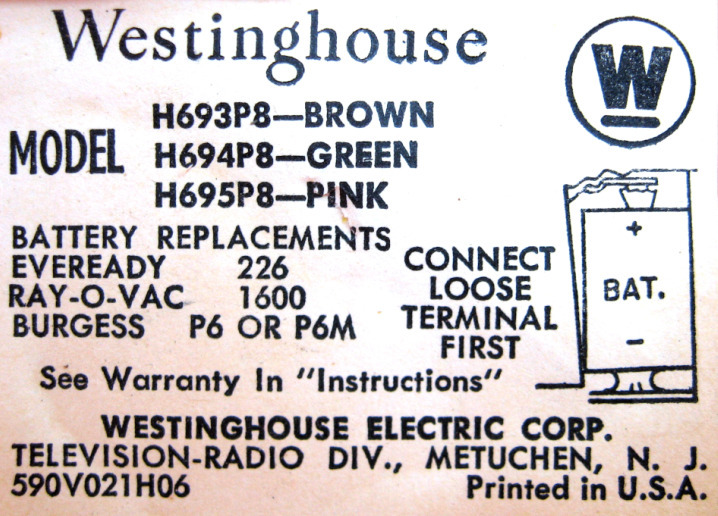 I acquired this Westinghouse with its leather case and Instruction/Warranty card. The leather case is very classy with Westinghouse printed on the front in gold and its fancy metal clasp, not unexpectedly exactly like the type you would find on a ladies purse. 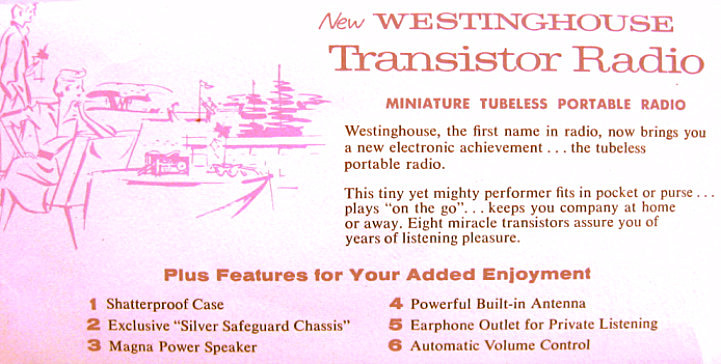 "A new electronic achievement... the tubeless portable radio"
"Eight miracle transistors assure you of years of listening pleasure"
This Westinghouse radio uses 8 transistors made by Texas Instruments.